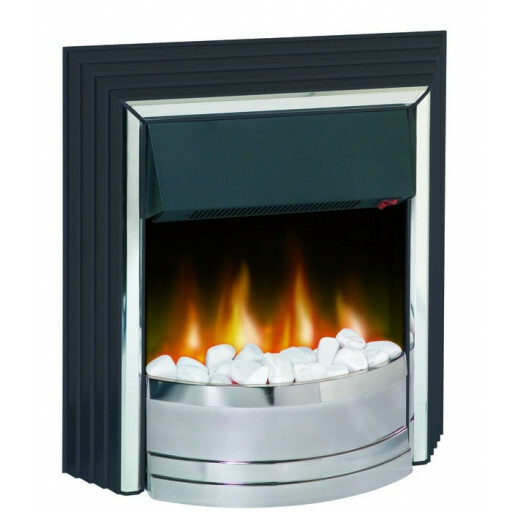 The Dimplex Chatham electric fire, in handsome Chrome/Black accents, is a freestanding unit that is designed to fit flush against the wall or can be hung on the wall. It requires no flue or chimney, so it's the ideal fire choice for use in buildings that don't contain this source of outside ventilation necessary for operating traditional fireplaces. What really makes the Dimplex Chatham electric fire so special is its unique Optiflame® feature, an effect that looks like live flames of fire dancing on the hearth that can be operated independently without any heat being generated.Real coals and white pebbles are included with the Dimplex Chatham electric fire for use in the black and chrome fire tray to give this fireplace even more authenticity. The powerful 2kW fan heater can be operated manually using a choice of two heat settings in order to accommodate a comfortable environment for everyone in the room. The Chatham electric fire is a sleek, contemporary electronic fire that makes a perfect finishing touch for any room of the home that needs a focal point in addition to a charming and cosy source of radiant heat.